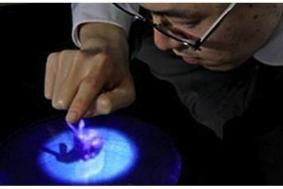 JAPAN: Could this little blue rabbit be the future of 3D TV? | What Hi-Fi? JAPAN: Could this little blue rabbit be the future of 3D TV? And this little blue rabbit, sitting on a table in a Japanese government-sponsored research lab, could show that they're thinking even more outside the box. Literally so, in fact. The idea of 3D TV was simple: it would enable TV manufacturers and content providers to charge premiums for their products in the face of tumbling consumer electronics prices and cinema attendances, and allow the likes of Panasonic and Sony to take a technological lead over their rivals, principally those from South Korea. Except it hasn't worked out like that: Samsung holds more than 80% of the US flatscreen market, and prices of 3D TVs have fallen rapidly, to the point where not much more that £1000 will buy you a very decent one in the run-up to Christmas. So some solid rethinking is going on, as manufacturers aim to re-establish a technological lead. There's a wide acknowledgment that no-glasses 3D TV may prove a major draw, and already some companies are showing viable, if rather small, TVs able to deliver just this.